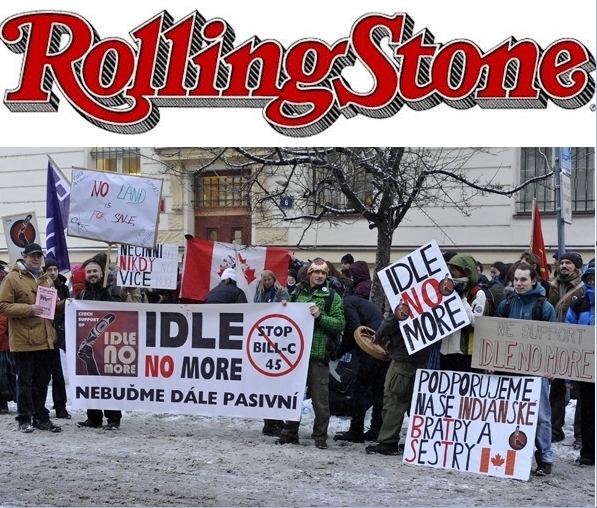 Rolling Stone Takes Note of Idle No MoreRolling Stone has gotten wind of Idle No More, and a story posted on February 4 explains in concise terms what the movement and the controversy that started it are about. Most notable is the article’s succinct explanation of what measures in the omnibus budget Bill C-45 and its companion, C-38, appear to undermine treaty rights and sovereignty, and why. C-45 “changes the way that First Nations approve the surrendering or leasing of territory, making it easier to open indigenous treaty lands to development,” Rolling Stone explains. However, Idle No More has potential, and one source in the story calls it a turning point for First Nations.Comment: For more on Idle No More, see Racists Infest Newspaper's Facebook Page and Spence Ends Hunger Strike.